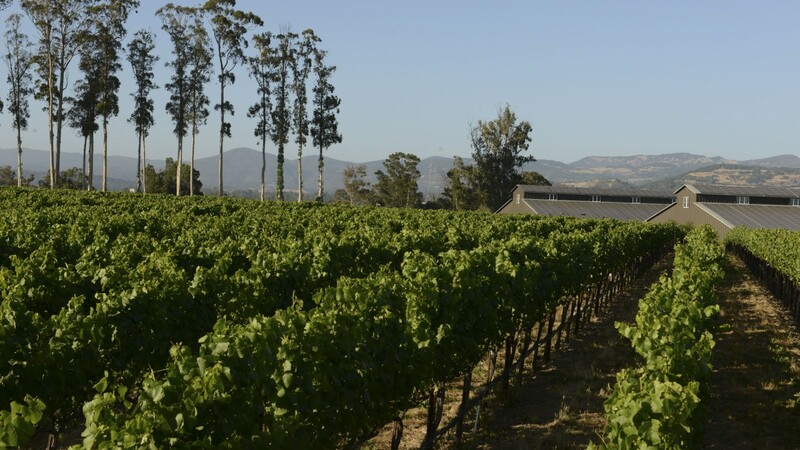 The Stanly Ranch Estate vineyard was planted in 2001 on a portion of the historic property originally owned by Judge Stanly, who produced wines from the property in the late 1800s. Merryvale’s 49 total acres are comprised of 35.4 acres of Chardonnay, 9.4 acres of Pinot Noir, 3.5 acres of Syrah, and one third of an acre of Viognier. The vineyard surrounds the state of the art Starmont winery at the end of Stanly Lane in the Los Carneros region of Napa Valley. The greater Stanly Ranch also holds an important distinction in the modern viticultural history of Carneros, with Pinot Noir and Chardonnay clonal trials conducted there in the 1950s by Louis Martini, the Wente family, and UC Davis. There are several properties within the ranch, all continuing to create sought after and highly acclaimed wines to this day. The soil type at Stanly Ranch is predominantly Haire loam, and the topography is mainly gentle slopes in the 2 to 5% range. The close proximity to the San Pablo portion of the San Francisco Bay results in moderate temperatures through the growing season and consistent southwest breezes. Due to the water holding capacity of the soil and subsoil, irrigation needs are minimal. Annual rainfall averages close to 22 inches, which is typically sufficient to delay the onset of irrigation until late June or early July. Whenever feasible, recycled wastewater from the winery is used for irrigation. The clonal selections of Chardonnay are 4, 15, 17, and 76. For Pinot Noir the clones planted are 114 and 667, both being Dijon clones originating in the Côte d’Or. Syrah clones are 174 and 470. Rootstocks are made up of 101-14, SO4, and 110R, all chosen for specific blocks depending on soil type. Row orientation runs southwest to northeast, resulting in an ideal amount of morning and afternoon sun exposure while limiting overexposure of the fruit. With the assistance of Regusci Vineyard Management, the property is farmed to the highest standards of sustainability and quality. The vineyard became Fish Friendly Farming and Napa Green Land certified in 2007. Permanent cover crops, reduced herbicide use, integrated pest management, including the use of beneficial insects and habitat improvement, and the use of softer chemistry materials for disease control are all emphasized.